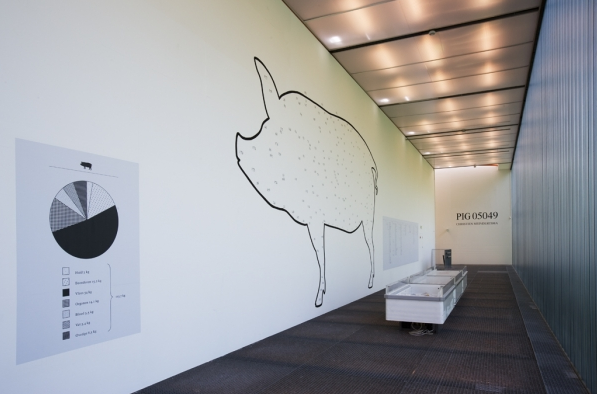 Here's a really interesting sounding exhibit and book: Pig 05049. It details everything made using one pig's body--all 185 products. Bill Buford's response here is (I gather) that traditional farmers have a more personal relationship with their pigs, but the killing is just as awful; furthermore, if you're going to kill an animal, you ought not waste any of its body. So--pig 05049, ho hum? I would say the French pig Buford ate for dinner was better off being able to graze around in a wide open field, while pig 05049 had no real life at all. Surely we should prioritize letting animals have lives over avoiding wastefulness.